The creators of coding environment Fuze have announced Fuze Code Studio for the Nintendo Switch. It is designed to make coding easy to learn and is currently available for Windows and Raspberry Pi. Fuze is more than a programming language. It is more like an IDE for BASIC. “It is a self-contained programming and electronics workstation,” as the website describes it. The possible applications range from coding games to controlling robotics. Fuze BASIC is easy to learn, so this IDE is great for getting kids and beginners into programming. Fuze Code Studio for Nintendo Switch will include a programmable speech engine and pre-loaded graphics and sounds for use in games. It will also have a library of commands for accessing Switch components like the JoyCon controllers and sensors. "FUZE has proven itself to be more than capable of teaching young and older minds alike, computer programming skills that engage, excite and stimulate computational thinking, problem solving and rapidly develop digital skills." Working with the preloaded graphics will make games seem cookie-cutter, but that is okay for beginner programmers. Plus Fuze says that graphics can be done from scratch as well for both 2D and 3D games. The company also plans to have extra content packs available for download, although Fuze does not indicate whether these will be free or for purchase. 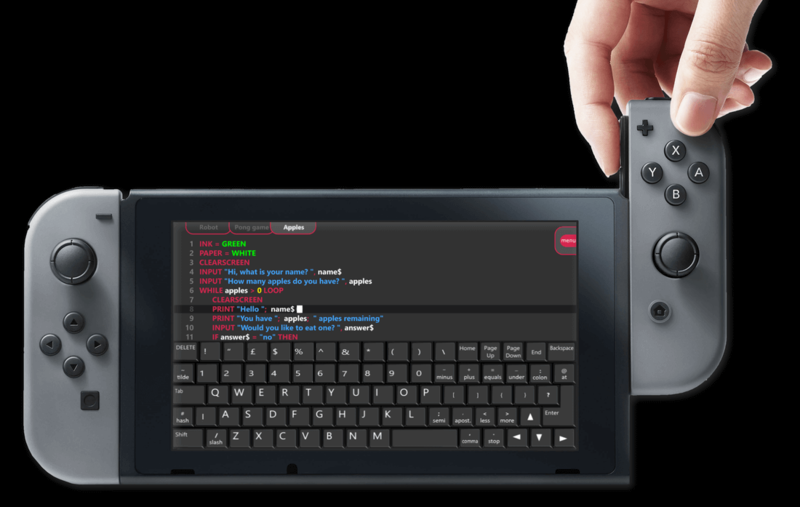 Programs are entered through the Fuze touch keyboard, but Code Studio also supports USB keyboards or code entry through the JoyCons. Admittedly, the Switch does not seem like the ideal device for programming of any kind, let alone game development, even with an IDE. However, coding directly on the device, users can see the results of their efforts immediately without having to save and load from another computer. I will reserve judgment on the Fuze Code Studio until it comes out, but what I can say about similar devices and programming environments is that I end up having more fun with them than my kids do and they eventually end up in a junk drawer in the shop, e.g., Sphero SPRK+. Unless one is committed to learning to code, the app will end up deleted after a short while. However, I do see the possibility of the app gaining a niche following with experienced home brewers. Depending on what can actually be done with it, creative coders could be producing decent content for the Switch after a short time. The question is; will there be a way to export, save, or upload that content so that others can play home-brewed games? Fuze Code Studio is slated for a Q2 2018 release.